When producing any great video, planning is key. There is no way that all the separate parts that make an effective video will come together and work, unless it has all been planned out. So, within this blog post, “How To Write A Killer Script For Your Explainer Video” I will be covering the template for the script, voice over, music and finally, the animation. All these crafts will come together in post production and you will have an effective, animated video that works for your business. Words are very important, especially within an Explainer, you have less than a minute to clearly convey your value proposition. A minute of script is approximately 150 words, but this will depend on the read you want. (A hard sell video will have more words than a soft sell video) Once you have a clear script, then we can add the visuals to enhance the words. Here is the template I work from when writing scripts for my clients. This is where you state the problem that you solve and you need to tap into the emotions of the person suffering this difficulty (hopefully the viewer) State the problem clearly. Explain how you solve the problem in the form of your value proposition. Keep this statement short and sweet and make sure the viewer understands it straight away. You can describe benefits, but not features. Be crystal clear on the solution you provide. Now you get to elaborate on the solution you provide, this is where you can describe features and benefits as well as explain your point of difference compared to your competitors. Go into detail here, this is where the bulk of the message comes from. This is where you briefly summarise and explain the action you want them to take next. Mention the company name and tag line to ensure branding, but tell them what to do next. Call, email or visit and provide the number or address. Once you have your script of about 150 words you can start to think about the voice over. Your audience has to identify with the voice you choose, so it is always a good idea to mirror your audience with your voice over. If your target market is predominantly women, then getting a rough, male, okker Aussie wont work. The other factor you must remember is the type of read the voice over artist will give it. For this you are after a warm, friendly delivery as this fits in with the purpose of the video, a friendly voice solving a problem for you. Music is a strange beast when it comes to online videos. You sit in either one of two camps, I don’t know what to use, so I use nothing, or the I don’t know what to use, so I’ll use any track I like. As a general rule, if you didn’t pay for it, don’t use it. Copyright and Royalty Free are completely different, so be careful with what you use. Here is a couple of sites that has free music available. Josh Woodward – A single musician with heaps of tracks for use. YouTube – A lot of people don’t realise that YouTube supplies free music as well. Can be found in the YouTube Video Editor. If you decide on producing your own Explainer Video, then you’ll need to find a site that will allow you to animate your killer script that you’ve written. Here is a list of three sites that will allow you animate your own video. One tip to help with your animation is have your logo and branding on hand for reference and keep the visuals simple. Don’t clutter the screen with images to build the scene. Strip it back to basics and your animation should flow. 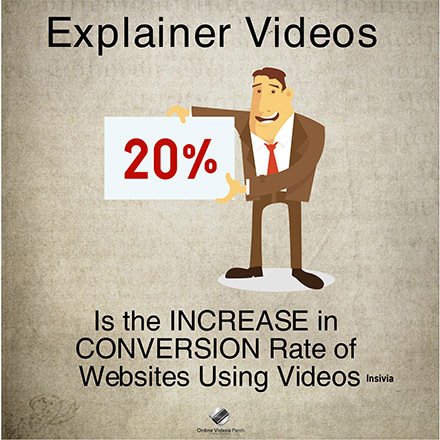 So, there you have it, how to produce your very own Explainer video for your business. You have no excuse, not to go out and make videos to help you business grow, what are you waiting for? When you do finish your animated video, please let us know and we would be happy to share the video to get seen by as many eyes as possible. If the idea of producing your own video takes your fancy and you would like to know a little more about your options for animation, please check out our blog post DIY Animation Tips For Explainer Videos. If you would prefer to talk to a professional, but would like a little more information, please visit our Information Page to watch a short video and register for an obligation free chat.